If you are at all familiar with this site, traditional and doom do not make it on here with any sort of frequency. This isn’t because it is disliked rather black and death are given more of a spotlight. Shadow Kingdom records is a label which is dedicated to both unearthing lost gems of traditional and doom metal as well as supporting current doom and traditional metal. 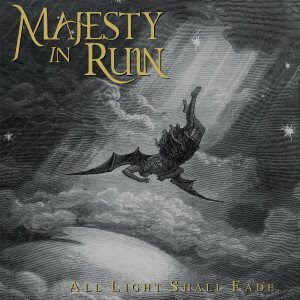 Majesty In Ruin is only really connected by the bassist, John Shamus Gaffney, who currently plays in Sinister Realm. Rich McCoy was in a variety of New Jersey metal bands including Coffin and Primitive Realm. Other than that Majesty in Ruin is an unattached traditional doom act who has one demo released in 2014. This sounds like a perfect place to start for a quality release. If the previous sentence sounded like sarcasm, it was not meant to be despite this band having not the sturdiest structure to begin a project. At times, Majesty in ruin Ruin feels like a fleeting doom project which is a second rate worship of bands like Candlemass and Solitude Aeternus. The fact that All Light Shall Fade is an engaging demo with both quality and potential for future releases is a testament to its creators as well as Shadow Kingdom for giving these guys a shot. If one is not completely sailing the rivers of eternity by the sounds of “The Lamp of Invisible Light,” then there is little hope for an afterlife in doom. It should be noted that vocalist Rich McCoy has a strong resemblance to past Candlemass singer Messiah Marcolin minus the sky high falsetto. Though both bands tread on the same territory, Majesty In Ruin manages to emerge as a formidable entity which is both independent of its influences and exciting if given the chance for more releases. Though everyone completely missed this first demo, hopefully the rerelease of All Light Shall Fade will lead to a full length which sails on the rivers of eternity.